I took this photo at Cooper Square, which houses the college of architecture and art known as Cooper Union. The statute commemorates the founder of the college, named Peter Cooper. He was industrialist, philanthropist and inventor. 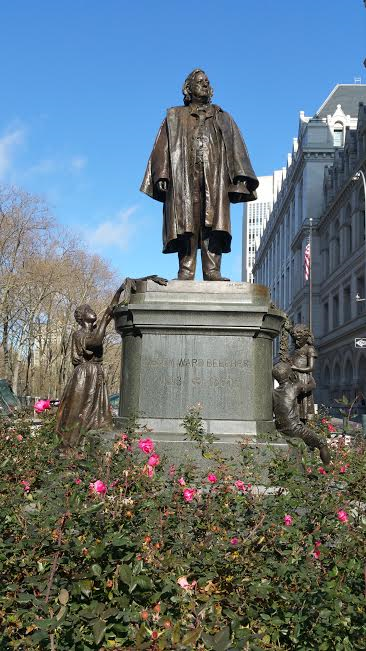 He is honored for establishing and founding the college Cooper Union. Through research, I also found out that he invented Jello! And his wife is the mastermind behind why some jello has fruit in it. I like the statue, because when I saw it I immediately thought of Abraham Lincoln’s memorial statue in Washington D.C., probably because they are seated similarly. His placement is suited well, because he can be seen from most angles of the square. I think I would have liked it if he was holding a cup of jello in his hand instead of a staff/walking stick. This entry was posted in Uncategorized on December 19, 2016 by Bobbie. This beautiful mural is located by Rogers place and East 163rd street in the Bronx. 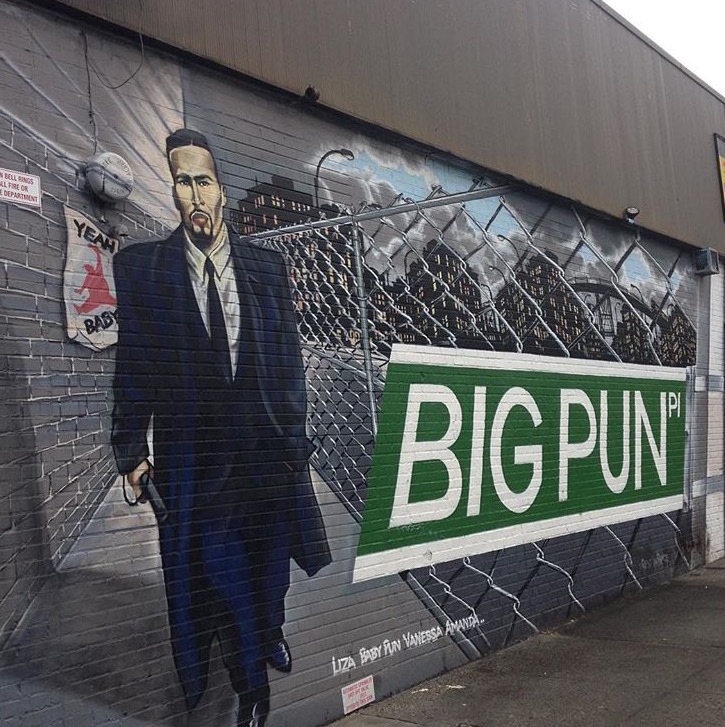 Christopher Rios better known as “Big Pun” is a Bronx native rapper. His success came arise in the 90’s when his first hit album went platinum. This led him to become the first Latino rapper to do so. Although he dropped out of school early, he still managed to be passionate about reading. It was even stated that he did well before having to stop school. Due to issues at home and not having a great family life, he had to leave there as well. His lyrics tell his story. Unlike most rappers today, his words and how he composed them to rhyme were amazing. Even if you aren’t a fan of hip hop music, reading a song as if it were a poem would leave you surprised. His play on words and vocabulary weren’t as basic as most. It is no surprise an art piece like this would be in the Bronx. Rios was of Puerto Rican decent. Many related to his music as he spoke our lives in his rhymes. A song can sing your life, or help you escape it. His did both for most. His unfortunate death due to a heart attack on February 7, 2000, left his fans saddened. Looking at this mural took me back to when I was younger and saw him at the Puerto Rican Day Parade. The painting sort of makes him out to be a “Boss”. Maybe he would’ve been, we’ll never know. This entry was posted in Uncategorized on December 19, 2016 by Alexandria. This Memorial structure is located at Citi Field Stadium, home of the Mets. 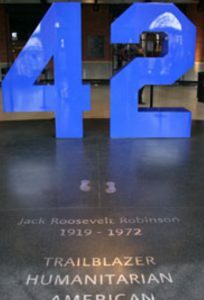 Jackie Robinson, as most of us already know, was the first African American player in Major League Baseball. Robinson being signed to the Brooklyn Dodgers made a great impact in sports history. It helped end the racial segregation in Major League Baseball. In 1962 he was inducted into the Baseball Hall of Fame. He not only influences those in sports, but also a culture. The talent he possessed not only made him be accepted but also gave recognition to the Civil Rights Movement. He sadly passed away on October 24, 1972., due to a heart attack. Basic rights weren’t available for people of color. Robinson received so many backlashes and hate for simply doing what he did best. Jackie didn’t give up; he changed not only his own life, but also millions of others. Many baseball players of color have him to thank for being a pioneer. As a baseball fan, I have nothing but respect and loved his memorial. 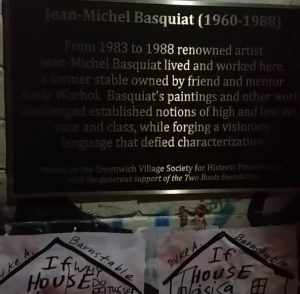 This plaque, located in Noho at 57 Great Jones Street, is to commemorate the talented Jean Basquiat. Basquiat was an artist from Brooklyn during the 1980’s. Some describe him as a “neo-expressionist” painter. He began with graffiti on subway trains and buildings. After years of continuing to pursuit his creative talent, he finally was featured in an art show. Basquiat received much critical praise for his work. Soon after, an original painting of his could go for over $50,000. He collaborated with famous artist Andy Warhol. 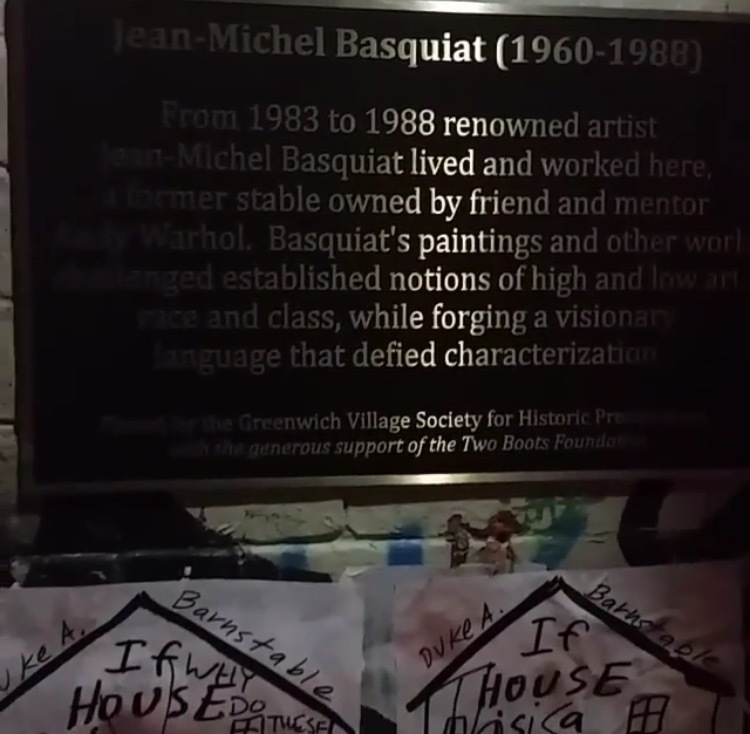 It was actually Warhol’s old loft at 57 Great Jones Street, that Basquiat later lived in. Unfortunately Basquiat had an addiction to heroine. He died of an overdose on August 12, 1988 at the age of 27. Being of Haitian and Puerto Rican decent he was known to have incorporated the “African-American and Latino experience” in to the prestigious world of art. Its such a shame to see someone with so much talent let it slip away because of an addiction. His art was original and political. He touched on racism and class systems. He was a voice that us minorities needed. Basquiat continues to inspire many. The way Basquait turn his talent into art that made an impact, continues to inspire the world. The mystery of the Sugar House Prison Window near the municipal Building in Lower Manhattan, it is called the David Dinkins Building and the plaque is in front of the Police Headquarters is to believed to be hunted by former prisoners. 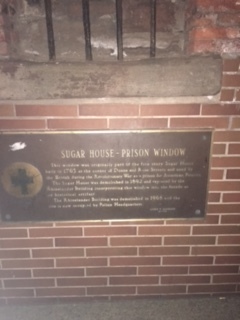 This memorial was placed in their honor, because the death toll was so high in this prison, which held Americans of the Revolutionary War. 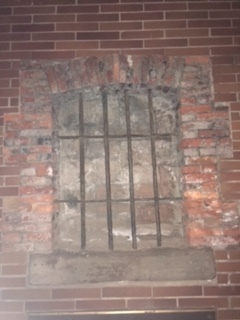 This placed was described as has having horrible living conditions and unhealthy food for the prisoners. The food was spoiled and filled with maggots that the prisoner refused to eat it and starvation was one of the causes for death. The cold bars on the window gave me a creepy feeling to think that people had to be in prison for various reasons while a major war was going on and the thought of them not being able to have a meal. Similarly, the prisoners in New York complain about the food and living environment today, I’m sure can’t compare to what these prisoners had to go through. 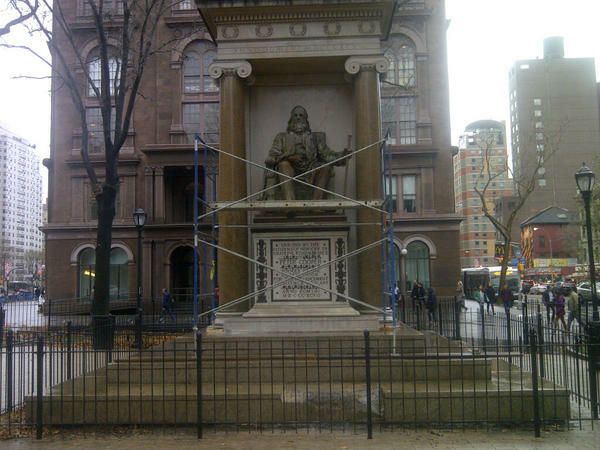 These prisons are remembered in the Trinity Churchyard and cemetery on Broadway and Wall Street. This entry was posted in Uncategorized on December 15, 2016 by Quiana Moore. For the past year I walk past this monument and haven’t had the time to stop. But today I decided once and for all to find out more about this monument. 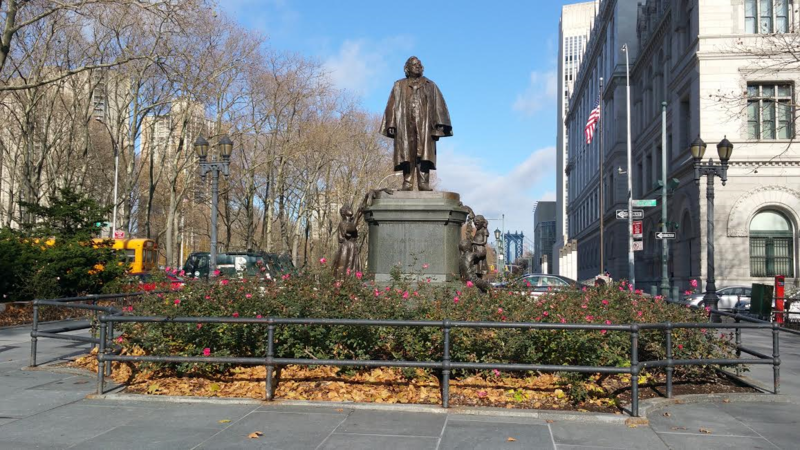 This monument is located in Cadman Plaza by Johnson Street. It is a male standing and next to it is a female and two children. The inscription reads Henry Ward Beecher / 1813-1887 the grateful gift / of multitudes of / all classes creeds / and conditions / at home and abroad / to honor the great / apostle of the / brotherhood of man. I found out that Henry Ward Beecher was a White American abolitionist, speaker, minster and writer. He opposed slavery and had mock auctions to help the slaves. As a minister, he helped spread the word with other churchgoers on freeing the slaves. He then helped raise funds to supply weapons to others who opposed slavery. “The rifles became known as “Beecher’s Bibles” because they were shipped in boxes labeled “Bibles.” I am glad I took the time out to stop and appreciate his accomplishments. A great man who helped create a better society. This entry was posted in Uncategorized on December 15, 2016 by Chinadoll. New York is one of the busiest cities in the whole and when someone passes away that takes the time to make sure New York remains beautiful, a memorial must be made. 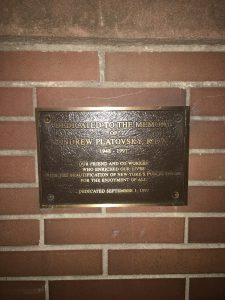 Andrew Platovosky died at the tender age of 49 on July 17th at his home. His mother Florence and his siblings Sandy and David survived him. My condolences to the family and thoughtful co-workers who decided to place a plaque near the Municipal Buildings in lower Manhattan for Mr. Platovosky. 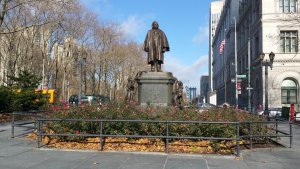 He was the designer of the Veterans Memorial Garden at Queens Borough Hall, the new pedestrians plaza surroundings municipal buildings and the Police Headquarters in lower Manhattan. The memory of decedent will forever be in the area he created for his friends, family and co-workers to remember him. The area is quite, beautiful and makes that small part of New York behind the Municipal buildings feel safe for tourist, New Yorkers and the people who just want a quite area to sit on a nice summer day. The area is filled with seating, food vendors and landscaping that Andrew still maintained after construction and with the police headquarters and the Catholic Church in the area it is peaceful and tranquil area. Thank you Andrew Platovosky for your time, creativity, hard work and commitment to the buildings you created. We are still enjoying it every chance we can. This mural is of Bob Marley and was taken on Herkimer Street and Nostrand Avenue. 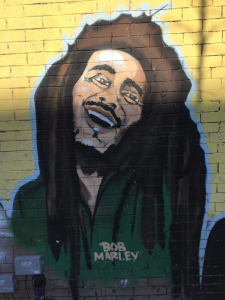 Bob Marley was a very famous reggage artist, singer, songwriter, and musician. He was born February 6, 1945 in Jamaica. He sold over 20 million records in his lifetime. He brought a new sound to music. Most famous for his songs “Jammin, Is This Love, One Love/ People Get Ready”. He’s also very known for his long dreads, which he was Rastafarian. It’s a religion which believes in your hair being in dreads because this type of religion does not believe in cutting off any hair on your flesh. As far as his music, he wanted his music to promote peace. He was very famous around the time where racism was very evident. He died very young at the age of 36. He died from a form of cancer. It was melanoma cancer found in his foot which first was a soccer injury he had. Doctors recommended he get his foot amputated but he did refuse to. When he finally decided to do it was too late. His cancer had spread. Shortly after he died May 11, 1981. His music is very peaceful and relaxing. You can still here his music being played all around the world. 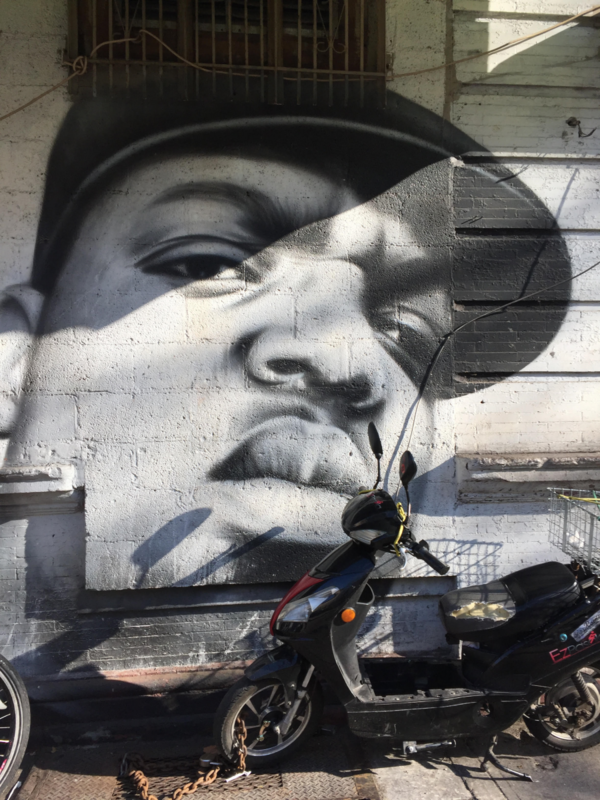 This mural looks just like him. He known for that beautiful huge smile. People of huge impacts are known to have murals all around the world. This entry was posted in Uncategorized on December 14, 2016 by Mandy. This photo is of Harriet Tubman and was taken on Herkimer Street and Nostrand Avenue. She was born in the 1820s in Dorchester County, Maryland. She was well known for helping to free slaves from the South to the North. She herself was a slave who ended up escaping. She was very successful at it. 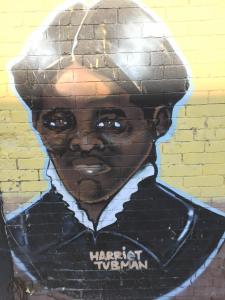 She used the underground railroad as way to help free slaves. She’s a very important person in history. She was very brave for what she did. It was not really known for slaves to escape and to keep coming back just to help free other slaves. It was very dangerous of her to do. If she were caught, she would have been murdered brutally. She died on May 10, 1813. She died of pneumonia. This portrait was well done by the artist who created it. She’s a reminder of how history once was. This photo was taken of a mural of Christopher Smalls (AKA Biggie Smalls). This photo was taken on Franklin Avenue and DeKalb Avenue. Biggie Smalls was a known phenomenal rapper of the 1990’s. He was well known for his blunt metaphor raps, as well as his controversy animosity with Tupac. He was born on May 21, 1972 in no other than Brooklyn, New York. He grew up in the ghetto of Brooklyn and grew up on hard times with his mother being a single mother. He was hustler who turned into a rapper. He was discovered by Sean Combs aka Puff Diddy. It was no time before Biggie’s name began buzzing in the streets. Most famous for his songs “Juicy, Big Poppa, Hypnotize”. It was murdered shortly after. He was murdered on March 9, 1997. You can still here is songs playing on the radio still today. He’s one of the most famous rappers of all time. This mural was done phenomenally. The portrait looks exactly like him. He was known for this mean- mug pose on basically all of his albums.